January 30, 2014 - The National Community Development Association (NCDA) has awarded "The Courtyard of Fort Wayne" apartments for foster youth in transition to adulthood with the Audrey Nelson Community Development Achievement Award. "The Courtyard is an exceptional community asset," said Fort Wayne Mayor Tom Henry. "It's an ideal public-private partnership designed to help some of our most vulnerable youth overcome obstacles and become successful adults. 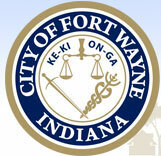 The City of Fort Wayne applied for the award, which recognizes exemplary uses of Community Development Block Grant (CDBG) and other federal funding. "The University of Saint Francis has already made a significant commitment to the revitalization of downtown Fort Wayne with the purchase of the former Chamber of Commerce Building and the former Scottish Rite," said Mayor Henry. "The university's plans to renovate these buildings and fill them with 250 to 300 students will advance educational attainment and the continuing positive momentum in our vibrant and exciting downtown. We're investing in our future with a strong commitment to education and quality of life."